This long-exposure image taken by Jesper Grønne in Denmark shows many Draconid meteors streaking out of the sky, October 2011. One of the most famous of all the "shooting star" displays, the Draconid meteor shower, will peak tonight (Oct. 9), but the celestial light show may be disappointing for casual stargazers. The Draconid meteor shower is created by the periodic Comet 21P/Giacobini-Zinner and is sometimes referred to as "Giacobinids." It is known to be the source of two of the greatest meteor displays in the 20th century; a dazzling show in 1933, and then again in 1946. 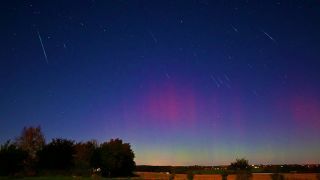 Lesser showers graced the October night sky in 1926, 1952, 1985, 1998 and 2011. Begin your stargazing night by gazing straight up at the sky overhead as soon as it gets dark. No special equipment is needed, just an open sky, a lawn chair or blanket on the ground, a watch, and a note pad of any Draconids seen. The Draconid meteor shower radiant — the point from which the shower appears to radiate out from — is near the head of the constellation Draco (the Dragon), hence the name of the shower. A shower member is a meteor whose path, if traced backward, would intersect this spot. While the 2013 Draconid meteor shower may be a bust, that wasn't the case in past displays. As darkness fell on the evening of Oct. 9, 1946, many hopeful eyes were turned skyward. Thirteen years earlier, in 1933, Comet Giacobini-Zinner brought in its wake a brief, intense shower of up to 500 shooting stars per minute over Europe! Now the comet was back, and both it and the Earth seemed correctly positioned for a replay. This time, it would be North America's turn and despite a full moon and widespread cloudiness over the eastern and central U.S., skywatchers were not disappointed. In Chicago, Wagner Schlesinger, director of the Adler Planetarium, counted 149 "flashing projectiles" in 10 minutes. Not bad, considering the moonlit sky was more than 80 percent cloud covered! In St. Louis, two observers watched the Draconids through holes in an altocumulus cloud deck "like white snowflakes in a minor snowstorm." Across the western U.S., where skies were mostly clear, rates of 50 to 100 per minute were recorded, in spite of the bright moonlight. Editor's note:If you snap an amazing Draconid meteor photo tonight and you'd like to share it with SPACE.com for a story or image gallery, send images, comments and location information to managing editor Tariq Malik at spacephotos@space.com. Joe Rao serves as an instructor and guest lecturer at New York's Hayden Planetarium. He writes about astronomy for Natural History magazine, the Farmer's Almanac and other publications, and he is also an on-camera meteorologist for News 12 Westchester, N.Y.